When people use the cliche "It's just like riding a bicycle" they are referring to how once you learn to ride in your youth you never forget. Well, the same pedaling technique you used when you were young may not be the best technique for riding your recumbent trike. What if I told you there was something you could do to help you go faster, climb hills better, and lessen the force on your joints? If you are willing to spend the time to master correct pedaling technique your riding will be so much more enjoyable and efficient. The most common pedaling technique is referred to as "mashing". Mashing is where extreme force is used to push the pedal down and away from the rider, one pedal at a time. 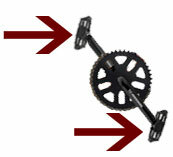 This usually happens because the gearing is too high and a high level of force is needed to turn the cranks. This is a common approach to riding an upright bike that you'll see when the rider stands on the pedals as they climb a hill. On an upright bike the amount of force is usually limited to your weight when you stand on the pedals, and since your legs are used to support your body's weight there is not as high of a chance that you'll hurt yourself. On a recumbent pedaling machine, like our trikes, you can actually push much harder than your bodies weight. If you've ever worked out in a gym or took weight training in high school, you'll be familiar with the leg press. The recumbent position is very similar to this and allows you to push your legs away from the back of the seat. Because the back of the seat keeps your body still, the average active person can typically exhert a force 2-3 times the weight of their body with each leg. This extra force is great and can make you go faster, but without training you'll end up with sore knees and leg muscles. A word that you'll hear frequently around cyclists, especially recumbent types, is "spinning". 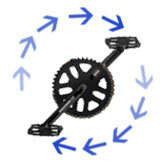 Instead of mashing the pedals and pushing the cranks one at a time you can train yourself to spin the cranks smoothly. Think of a hand-crank pencil sharpener and you take the handle and use a fluid motion to turn the crank instead of just pushing back and forth like a saw. Spinning minimizes the amount of force on your feet and knees. At the same time, proper spinning technique can increase your pedaling force by allowing you to pull on the cranks as well as push them. To learn and use proper spinning technique, we do recommend making the modest investment in proper pedals and shoes. At a minimum you'll want toe straps that hold your shoes onto the pedals, but we recommend getting something more secure like clipless pedals. Our favorite is the Shimano SPD pedal system, but there are other systems out there. With your feet firmly attached to the pedals you can apply an even force with both legs for each revolution. Once you master the actual process of spinning the cranks you'll want to develop a cadence (pedaling rpm) that will allow you to apply maximum power to the pedals without hurting your joints. Most people without any training have an average cadence of about 60-65rpm, which when combined with a high gear and mashing technique can move you along pretty good. By using a higher cadence and a lower gear you can go the same speed without the stress on your joints. A good cadence to shoot for is about 85 rpm, although some faster cyclists may keep their cadence in the 100s. The best way to find your ideal cadence is to use a cadence sensor that will tell you your rpms as you ride. That way you can shoot for a target cadence and train for that. A great way to train is to pick a higher cadence as a goal and drop to a lower gear until you can ride that cadence comfortably. You'll know that your cadence is good when you can ride without your knees hurting and the hills become easier to climb. Well, that is my pedaling advice and you can use it or not. If you are a casual cruiser then it may not make any difference to you. If your knees are hurting when you ride then these tips may help you. If you want to climb hills faster, then spinning fast will definitely help.